Peace processes – Yugoslavia - What Should Have Been Done? Yugoslavia caught international attention through acts of violence late June 1990 when Slovenian border guards close to Gorizia shot at their Serbian counterparts. And Yugoslavia retained its grip on international attention ever since, according to the rule of bad journalism: violence up, attention up; violence down, attention down. The “Balkans”, that southeastern corner of Europe on which the West, the “international community”, projects its own somber shadow of centuries of ethnic cleansing and other cruelties, meets the bill. Everybody sufficiently violent, from the smallest fringe to that very “international community”, can get their instant prime time/front page media fame. Years of patient NGO and UN work for peace will certainly not rival them. On October 14, 2003, in Vienna, high-level Kosovo-Albanians and Serbs from Belgrade met face-to-face. It was a historical meeting in more than one sense. It provides an opportunity for anyone concerned about conflict-management and peace-building to reflect on its philosophy, methods and politics. Did the international so-called community do the right thing? Is there adequate institutional learning? Are there parallels between Kosovo, Afghanistan and Iraq that we should discuss self-critically rather than simply blame the parties? It is the first time since NATO’s war on Yugoslavia in 1999 that Serbs and Albanians meet this way. Indeed, with a few exceptions, it’s the first attempt at real negotiations since it all began in the late 1980s. Like in Iraq, the main parties were prevented from meeting. As time has passed hard-liners have taken over the scene and now they won’t really talk. Being the clear victims of Milosevic’ repressive policies, the Albanians rightly felt that they had the support of the West and would be rewarded by sticking to a maximalist position; thus no compromise about the goal of complete independence. We cannot stand by, watching a government committing serious crimes against humanity, even genocide, on its own population. Certainly not! The doctrine of national sovereignty “within recognized borders”, like the doctrine of patria potesta giving the pater familias a carte blanche for terrorism within the walls of a recognized home, are cultural crimes against humanity, drawing artificial borders for human solidarity, delivering the subjects to the dominio of whoever are the tyrants. The Roman law construct relating owners to whatever can be owned paved the way for such institutionalized crimes against humanity as slavery and colonialism. The problem arises when “whatever can be owned” includes human beings, for almost any definition of “ownership”. The individual ownership takes precedence over the communal. Western politicians insist that Slobodan Milosevic must be brought to the Hague Tribunal and stand trial as a war criminal. Media and commentators raise the issue time and again. But there are reasons to believe that this is make-believe. The indictment of Milosevic leaves much to be explained – for instance, why he is indicted only for crimes committed in 1999 but not before – and certain Western countries would hardly want him to be on record in the Hague with a few things that he may know about them. The West would, therefore, do wise to drop this issue now and let Yugoslavia deal with Milosevic. “As pointed out by Justice Arbour in her application to Judge Hunt, “this indictment is the first in the history of this Tribunal to charge a Head of State during an on-going armed conflict with the commission of serious violations of international humanitarian law”. The indictment alleges that, between 1 January and late May 1999, forces under the control of the five accused persecuted the Kosovo Albanian civilian population on political, racial or religious grounds. By the date of the indictment, approximately 740,000 Kosovo Albanians, about one-third of the entire Kosovo Albanian population, had been expelled from Kosovo. Thousands more are believed to be internally displaced. An unknown number of Kosovo Albanians have been killed in the operations by forces of the FRY and Serbia. Specifically, the five indictees are charged with the murder of over 340 persons identified by name in an annex to the indictment. As will be seen, Milosevic is indicted for activities limited to the period January 1 and late May 1999, i.e. during the local war between Kosovo-Albanian forces (KLA/UCK) and various Serb/Yugoslav forces and for activities during NATO’s bombings which started on March 24 and went on for 78 days. At the time the Tribunal could not know any precise facts or numbers. What we do know today from public, reliable sources is that a considerable part of the information about killings and ethnic cleansing was exaggerated or false. Milosevic certainly did not even think the thought. The opposition had hoped for it but hardly foreseen it would happened just like that. Western leaders and commentators had predicted about everything else but this: that nonviolence by the many would sweep away the authoritarian power presided over and solidified by Slobodan Milosevic over 13 years. It was a miracle unfolding, minute by minute, in front of our eyes. 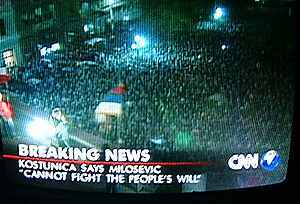 Unarmed citizens were stronger, finally, than Milosevic’ force. They also achieved in about 24 hours what NATO violence could not achieve in 78 days. It’s yet another remarkable victory for non-violence. But do we see it like that? These fundamentally important events in contemporary history, like hundreds of smaller changes brought about by non-violence and civil disobedience around the world, have seldom been covered by the media or referred to in history books as victories of nonviolence the way military victories are seen as the result of violence. Nonviolent revolutions like that in Yugoslavia ought to be analyzed as a manifestation of alternative power, not just as a lucky chance. “We are seeing it for the umteenth time in international conflict-management: when intellectual analysis and politics fall apart, cover it up with military potency and give it all a human face! One would like to believe that the West’s moral, legal and political conflict ‘management’ disaster in the Balkans and in Kosovo 1989-1999 would be debated throughout the West – democracies with freedom of speech. The silence about that failure, however, is roaring. It’s just the locals who won’t understand how well-meaning we were and are!